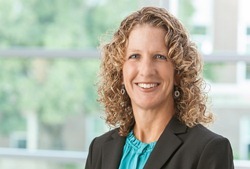 UNMC › Radiology › Faculty › Kimberly Apker, M.D. Fehringer EV, Burns EM, Knierim A, Apker KA, Berg RE. Radiolucencies surrounding a smooth-stemmed radial head component may not correlate with forearm pain or poor elbow function. J Shoulder Elbow Surg 2009 Mar-Apr; 18(2):275-8.